I am, I admit, a commitment-phobe. To a weird degree, possibly to a pathological degree. Having never sought psychoanalysis, I don't know its deeper roots - but they are there. I plan, in a work-required-occasional-Gantt-chart kinda way. But I don't plan in a save-for-the-future, make-plans-for-next-year's vacation now, get-good-grades-to-go-to-college, do-laundry-on-Tuesdays, yes-I-can-bring-a-dish-to-next-month's-dinner way. I don't obligate myself to school projects in advance, I don't organize the group outings, and I have run out of gas and stood by the side of the road often. I am late for appointments and I have chased my children down countless times after the startling realization that it is (Monday, Tuesday, Wednesday) and so they need their (leotard, trumpet, check for so and so). But I recognize that I should commit. I should plan. I should pay attention and life works better when I fully engage. I recognize that therein lie so many of my problems. And I know - and not only because I have written about it for fitness and 'leadership' websites, for sales materials and business proposals - that accountability is the key to so much success. This is all I have: my imaginary support group in my head, and my 7 or so regular readers (you!). Here I am. I am standing up. I am me: and I have a commitment problem. So. When a friend (Dyana Valentine!) sent me her video newsletter declaring this the month for 40 days of her, and in it (every day for the first twenty days) there was an appeal to pick something, anything, and claim 40 days of a better you... I finally relented. For half. Half seemed manageable. I dropped a note. I said that I would, as my commitment, work out - with intent - daily, for the 21 days remaining of the challenge. I made it day 1 (boot camp) day 2 (a run) day 3 (boot camp) day 4 (every single time I walked back up the hill to get something for one of my children during the soccer game I fully engaged my quads AND my core. Surely that counts, right?) Today... day 5. Sunday. A cold, lazy, churchy, errandy, Sunday. Post-church, I fought the Littles through mandatory shopping - Bass' pants all show ankles and there is a freeze due tonight. I got home, and considered sending them away until morning and then remembered Dyana. And the commitment. And my new music . So I sucked it up. Swallowed my anger (softer now, since the Big One had returned from football). Then challenged them to a run. And they took it. 7 and 9, they kept up. Crazily. Arms waving, weaving around my legs. 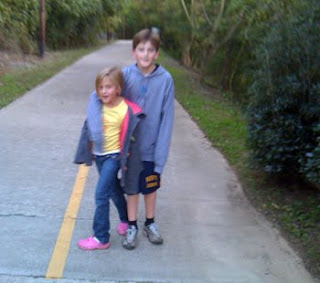 Annabeth in Crocs - and inexpicably, her better coat. Sebastian in summerwear and the hoodie that "finally" makes him look like "all the other kids" in the fourth grade. For two-plus miles they laughed. And we danced. And we moved. And we moved fast. And so tonight, in addition to the tired sense of accomplishment that comes from a run, and the (literal) strides toward dropping the 5 pounds gained on my 'last hurrah' business trip for the company that has so recently rejected me... in addition to that, I made up with my Littles. I laughed. And I took a few steps further into that commitment. For days down, sixteen to go. YESSSS!! Way to go and also kudos for getting the Littles involved. I'm SO glad there was dancing, laughter and speedy love.